Remember all the way back to February when, after a rather boring Super Bowl, thousands of fans got to hang out in East Rutherford or Secaucus Junction waiting for New Jersey Transit to run enough trains to get them home? You’d think the regional rail operators around the city would have learned the lesson that, for marquee sports events at inconvenient locations, regularly scheduled commuter rail service isn’t quite good enough and even the so-called “event” service isn’t enough either. For both the horse and the agency, Saturday could have gone better. After watching the colt tie for fourth in the Belmont Stakes, tens of thousands of Long Island Rail Road riders struggled to leave, standing in serpentine lines for hours, berating police officers over a lack of communication from transit and racing officials and, at one point, packing themselves so tightly atop a rickety pedestrian bridge that it had to be cleared for safety. And so, just over four months after New Jersey Transit’s misadventures at the Super Bowl, the New York City area has been faced with the same vexing question: How has a region that prides itself on handling large crowds for major events — baseball games, political conventions, New Year’s Eve — been tripped up yet again? The answer, officials and transportation experts said, is a combination of misguided estimates, inexperienced riders and a bit of bad luck, at least at the track. The railroad expected about 20,000 people to ride to the races and had publicized its service throughout the week. Nearly 36,000 took the train to the Belmont station, prompting the railroad to summon extra service for the post-race crush at the track’s typically little-used station. Coverage in The Journal took on a different slant still. The delays, LIRR officials told Yoni Bashan, were expected. “There wasn’t a single extra train that we could have run that we didn’t run,” an agency spokesman said. Therein lies the problem. The MTA isn’t going to upgrade Belmont for one day a year, and, as both papers noted, these complaints never pop up for regular service after events at Yankee Stadium, Citi Field or the Barclays Center, venues located near subway lines. So this may just become the new normal at places that were built for auto traffic without reliable, regular mass transit. Belmont and the Meadowlands will still see many many drivers, but as train travel in the region becomes the norm, longer waits due to infrastructure deficiencies will continue to be a problem. Who’s looking forward for a solution? I’m confused. Is this the same Belmont station as this one on wikipedia (http://en.wikipedia.org/wiki/Belmont_Park_Branch), showing 4 platforms with 8 tracks? Yes, the station is as noted with multiple platforms and eight tracks, however, ALL of those lead into a SINGLE track over a bridge AND in order to get to the westbound track for Manhattan has to cross over ALL FOUR tracks to do do. This has ALWAYS been a problem on return trips for years. It needs to be remembered the Belmont Park station was built for a completely different era, first in the 1930’s and ’40s and then in its current form when the track re-opened in 1968 after being rebuilt. Back then, even on big days you usually had no more than 60,000 or so, and in fact, it was rare to even get to 70,000. In fact, when Secretariat won the 1973 Belmont Stakes to complete his Triple Crown, Belmont Park “only” had 69,000 on that historic day (which wasn’t even the most attended day in New York that year as 73,000 would show up a few weeks later at Aqueduct to see Riva Ridge, Secretariat’s stablemate win the Brooklyn Handicap at Aqueduct). Back then, the emphasis was on races for older horses more than the Triple Crown with New York racing fans, and that showed except for 1971, when 82,000 did show up to see Canonero II’s failed attempt at the Triple Crown, but he was was Argentina and many came from there to see that Belmont. Even in 1987 and ’89 when after a long period with not even a chance at the Triple Crown, Alysheba and Sunday Silence in their years only drew 65,000, as it’s only really been since 1997 (when we had a stretch of six chances in eight years between then and 2004) have we seen the crowds soar to the record levels on Belmont Day that the Belmont Park rail station was never equipped to handle. 1. If you don’t mind walking a bit, walk from the Grandstand Entrance and gate onto Hempstead Avenue, walking west (making a right, you should see a cheap motel at 223rd Street and Hempstead Avenue as you walk). From there, continue on Hempstead Avenue until you reach Springfield Boulevard (about 6-7 blocks from Belmont Park) and then make a right. From there, it’s a straight shot to the Queens Village LIRR station, which has trains on the Hempstead Branch that run once an hour to the Atlantic Terminal in Brooklyn (change at Jamaica for Penn Station). These trains are MUCH less crowded than the Belmont trains, plus at Queens Village you can (if they still have them) get a City Ticket for use to Penn Station). 2. Take the Q110 Bus (which stops inside the parking lot near the grandstand entrance on Belmont Stakes day and right next to the entrance most regular days) to Parsons Boulevard. From there, you can take the (E) train if you are going directly to Penn Station OR if you are going to lower Manhattan or Chinatown take the (J) train there. I previously posted my views on how I would have handled Belmont Stakes Day at Belmont Park? if I were running NYRA on Facebook and elsewhere. Just to clairfy the second part of my last post was a cut-and-paste from another areas I posted previously. That “previous posting” is actually what I subsequently posted separately here. Thank you for the explanation. I also saw the post on the LIRR today, which also explains the situation (single track spur, not single track station, without substations etc.). It seems to me that there were hard constraints due to the railway infrastructure that you can’t get around. But LIRR could have handled the crowds better (information on the ground was apparently abysmal); and they could’ve run shuttle buses to that other station; or at least directed people there. They could’ve also started running return trains earlier. I do not understand why having 1 train per hour at the Queens Village station and an admitted very long walk is promoted as a good option for the Belmont Stakes event? While I suppose that any movement toward one’s destination is much better than waiting for hours in the crowded terminal waiting area, we’re still talking about 3-4 trains during the whole waiting period of 3.5 hours that many folks reported. At the Belmont station in that same time period it was reported that 26 trains were used. People walk at different speeds. A long walk (it’s still less than one mile) to transit from a crowded event serves to distribute the crowd somewhat. Mentioning Queens Village as an alternative helps people who want to get away from the crowds. It wouldn’t work to supplement or replace Belmont unless you ran more trains. The line can handle more than one per hour. But add in the LIRR stops at Queens Village and Bellerose, shutting down the roads leading to them so people can comfortably walk there, and you could have moved people faster than just Belmont. Add in shuttle buses, with an exclusive lane if possible, to Jamaica and you could have dispersed the crowd even faster. Of course union rules mandating 8 hours pay for working special trains makes it more expensive to move people faster with more trainsets. If you know you cant do it with trains, then you lease buses for the extra capacity. Who’d lease the buses? The MTA? If so, I’m pretty sure that wouldn’t be necessary. If so much of the problem was the limited capacity on the decaying segment of track, and limited power to it then they should have shut a few streets in the area heading towards the track and had people walk to Queens Village or Bellerose. Leave half of Hempstead open for cars leaving so you don’t slow them down too much, but traffic heading towards it would have to be rerouted. This isn’t the first time this has happened. I was there the year Smarty Jones was going for the triple crown and they had a power outage and we ended up walking and found a private cab that took us back to Manhattan. The amount of people was crazy. One issue that would help is if they had a train going back to Jamaica a little earlier. Maybe a shuttle train back and forth to Jamaica. The once you are there you are stuck all day is kind of stupid. I bet they would fill up a train heading back before the big race. 1. Kept Belmont Park open until AT LEAST Midnight with full card simulcasting starting at 7:15 PM AND had Game 2 of Rangers-Kings on monitors throughout the track AND on the giant screens in the infield with the NBC Sports coverage on the PA system. If the game were still going at 11:35 PM (which it was), Belmont Park would remain open until 25 minutes after the game concluded (in this case with Rangers-Kings having gone to a second overtime, approximately 12:15 AM). 2. Worked with the LIRR to have service run from Belmont Park beginning at 7:10 PM (with a handful of trains ahead of that for people wanting to leave early) and continuing until at least 11:45 PM. If the Rangers-Kings game was still going at 11:10 PM, that would have continued until at least 35 minutes following the conclusion of the game (or with Rangers-Kings going to a second overtime approximately 12:30 AM). This would NOT ONLY have smoothed out people leaving Belmont Park as some would stay and get dinner before heading back (and I would have also had severely discounted food and NON-ALCOHOLIC beverages available starting at 7:45 PM after the 12th Race to encourage people not to leave all at once), but knowing the game would be available all the way through after The Belmont Stakes (something I would have made clear in all advertising), NYRA would likely have picked up a large chunk of the 10-15,000 or so who were “on the fence” about going to Belmont Park, but ultimately didn’t because they didn’t want to miss ANY of Rangers-Kings. In addition, I would have worked with the LIRR to allow people to use tickets for Belmont Park on ANY train stopping at Queens Village, Bellerose or Floral Park Stations going towards Manhattan following The Belmont Stakes and advised people to please walk to those stations if possible. In addition, I would have asked the LIRR to if possible have trains that operate on the Port Jefferson Branch stop at ANY of those stations to pick up people coming from Belmont Park as well (and again, honoring all Belmont Park tickets). That’s how I would have handled Belmont Stakes Day, assuming 140,000 in attendance for the full day with 25-30,000 of that crowd staying to the end of Game 2 of Rangers-Kings. 1. A ban on backpacks and large bags (a published one anyway, some reported backpacks were being allowed in anyway). That likely cost NYRA 25-30,000, many of them “daytrippers” who use public transportation and won’t go anywhere without a backpack (which in turn if they mostly used the LIRR would have actually made things way worse). That number is actually low, but that is because of…. 2. 10-15,000 or so that were “on the fence” about going, but didn’t because they didn’t want to miss ANY of Rangers-Kings (I noted in a prior post on this much more extensively). That’s why I would have assumed 140,000, however, based on what was widely being predicted by others. From what I can see from Google Maps, the single track is one thousand feet long, with a double track bridge on one side and the triple track mainline on the other. There is a parking lot on one side and a material storage yard on the other side of the right of way. With one hundred twenty five dollars per linear foot of railroad track, adding a second track should cost about 125,000 dollars. Even including two new track switches should not push the cost past 200,000 dollars. Adding the second track is well worth the cost of clearing up that bottleneck. I’d guess the bottleneck is just as much about the at-grade crossing where the spur hits the main line as it is the single track limitations. A flyover for westbound traffic would be very helpful too, but expensive. If we were talking abt rush hrs, yes the crossing of the main would be a problem. But IMO, it shouldn’t be that big a deal on a weekend. PS – “Some 150,000 people were drawn to the track on Oct. 30, 1910”, before most any of them had a car or bus available. The Mainline crossing is a very big problem, at all times of the day, especially for westbounds. There is more Mainline traffic steaming through there on the Weekends than you might think…and the Belmont trains have (and their return equipment runs) have to be woven in to the existing schedule. I think your numbers are more than a little off there. $200k ??? But there is more than rail and a couple of switches that is needed there would be ties and ballast and signals and 3rd rail too. And that is before you do improvements that have been demanded at the actual station such as making the platform high level. If LIRR has money to spend (and it would be in the tens of millions price range) then there are a whole host of other things that they could and should spend it on that would benefit customers day in day out rather than on one day a year. He said a linear foot of track, not a linear foot of rail. Track would include ballast and ties, though not signals. The high hundred thousands to low millions is a pretty reasonable price for the station improvements plus tracks. Tens of millions is ridiculous, though that doesn’t mean I’d put it past the LIRR. If it wasn’t the LIRR, I’d suggest using Belmont as a park and ride with frequent shuttle service the rest of the year. Since the plan is to turn service to Atlantic Terminal into a shuttle when East Side Access opens, perhaps subway-like service could run from Belmont, serve the Queens mainline stops, and run to Atlantic Terminal. Since it’s the LIRR, however, any attempt to do anything like that would become a ripoff. Here is an idea. Run that service using NYCT personnel and NYCT maintained trains, and turn the stations along the route into subway stations with turnstiles. Then we’d just be ripped off on ROW maintenance. Larry I’m sure I’ve read a proposal on either here or LIRR Today to do exactly that – create a park and ride which *might* make the costs of improving the infrastructure more bearable. Isn’t the point of turning Atlantic into a shuttle to minimize the number of trains crossing in front of each other to increase throughput at Jamaica for Manhattan bound trains? Would they be able to extend the shuttle east that simply, or would they need to build some new flying junctions as part of it? It would not be that difficult to extend the cross-borough Brooklyn scoots to Belmont (or Hempstead). They can still build the new platform F, keep things out of the way, then have trains use tracks 10 and 11 through Jamaica to get to Mainline 4 where they can get to and from Belmont and the Hempstead Branch without ever crossing paths with the Mainline. I detailed how such a plan might work here. I’m gonna go ahead and be “that guy”: After the Stakes finished, I snaked my way through the crowd to the lower level underneath of the transit pedestrian bridge, hopped on my bike, made it onto Hempstead Turnpike in five minutes, and home to North Brooklyn in about an hour. I have a feeling that if streets like Hempstead Turnpike, Jamaica Ave, and Metropolitan Ave were a little more people-friendly, we really could make a significant dent in the transit mode share. As long as you obeyed the traffic laws, that’s fine. Spur lines at Belmont build decades ago and the spur to the Meadowlands built a few years ago. What both share in common is a failure to properly link and integrate those spurs into the regular service. It’s forgivable at Belmont, because it was built before the current emphasis on mass transit. The fix would be worth it because people who might take it for the day trip to Belmont during a stakes game might realize that mass transit is a good alternative to driving to other destinations throughout the region, including work. A good outcome on race day would have a multiplier effect on getting people to consider mass transit over driving. I wonder just how much it would cost to fix the situation at Belmont. Starting at the platforms, they could realign the tracks using the two disused platform access stairs/escalators to the east side of the current tracks to build a new 10/12 car access platform (and I’d suspect upgrades to ADA and additional escalators would be part of that) without disrupting the current platform access in the interim. From there, you’d build out a second track to the mainline heading west, plus two-track to the East. All this takes place on LIRR property, and there’s already ROW that was torn out at some point from the look of the overhead imagery. But as a result, you’d end up with fewer platforms, but vastly improved service as a result. Adding tracks would be a manageable cost comparatively speaking since it would improve the number of trains and movements through those interlockings. The higher cost would be adjusting the platforms for longer trains, ADA compliance, etc. Yet, even that is manageable in the scheme of LIRR service over the long run, since these benefits would hold for years and decades out. It might even spur (no pun intended) the MTA to contemplate making the station a park and ride due to its ability to handle crowds, rather than relegate it to race days. The problem with the Meadowlands was compounded because the NJT refused to build a through-track and instead opted for a spur line where all service was forced through Secaucus. And that’s realizing that the state was pushing to make Meadowlands a year-round destination with the Xanadu/American Nightmare mall facility being built adjacent to Izod/MetLife. If it was built as a through-track, you’d get significantly improved service on Pascack through the area and improving service from the rest of Bergen County without having to take extra trains to do so – it’d be a true one-seat ride. Security would be more of an issue (you’d have to do security checks at multiple stations along the way, rather than concentrate at Secaucus, but that’s manageable with local police spreading the load on those kinds of events). But in the interim we’re stuck with the system we’ve got. Even if that were done, the current tunnels cannot handle a 100% increase in demand as a result from Eastern Bergen and Rockland Counties, so a second tunnel with a link near Croxton Yard needs to be built – hence why the line was put on the backburner until ARC was complete. Except that the Meadowlands spur was built so that it runs up the Pascack Valley to terminate at the stadium, rather than directly run off the Bergen line, which would have been the preferred routing (and the one indicated on this map showing the West Shore and Northern Branch routings) since it would have allowed for greater through traffic and quicker turnaround to Secaucus instead of having to do a loop around the North side of the sports complex. It was built bass-ackward, and would never be able to handle the kind of traffic envisioned during peak periods. So, unless they’re going to build a brand new track alignment across Berry’s creek and Route 3 to link to the terminal already built, we’re going to have one heck of a screwy alignment in the Meadowlands to connect to anything going towards the West Shore. And I chalk that up to gross incompetence on the part of NJ Transit, to say nothing of being incapable of controlling costs on the spur line, or any other capital project going back 20 years. Belmont was not only built before the current emphasis on mass transit, but at a time of TOTAL dependence on it, over 100 yrs ago. The Belmont Park rail station was built with private funds I believe for and by August Belmont in a completely different era. You had different rules on rail usage then before many safety rules were in place and well before the use of the electric cars used at present (which is why the small elevated settings had to be built in fact). This station was NEVER built to handle today’s crowds on Belmont Stakes day under today’s rules. Most importantly, the LIRR cannot just say, “We threw every train we had at it, oh well.” They are a part of the biggest transit agency in the country that controls a massive fleet of buses which went unused. This is not how a government agency should manage crowds – one of its basic responsibilities. Estimate attendance, overestimate the percentage of people using transit, and develop a plan to move that many people in about an hour. That did not happen. Reading the above posts and looking at google maps, it really does seem like adding a fleet of shuttle buses to Queens Village station (or even just telling people to walk there), and using all 8 tracks at Belmont could have solved this problem. The whole thing just speaks to a larger culture of incompetence that exists at the MTA, Port Authority, NJ Transit, etc. They act like showing up to work and doing anything at all abdicates them from responsibility to actually move people effectively. What’s the least you can do and not get fired? I think this is it. Except using all 8 tracks creates two problems. The first is that tracks 1 and 8 lack accommodations for high-level trains. The second is that this doesn’t clear up the single-track-to-crossing-the-Mainline bottleneck issue. Tracks 1 and 8 at Belmont are yard tracks, and cannot accommodate passenger train boarding. They can, however, use the middle six. However, passenger loading/station capacity was not an issue. Trains were fully loaded and then sat there for 20 minutes waiting for a slot to get out onto the Mainline. The crowd was 36,000 or so. Let’s say the average wait was 2 hours, guestimating from the 3:30 full wait, gets 50,000 hours spent waiting. Assume the average hourly pay is the proposed higher minimum wage, $10.10 an hour. So people waiting to get on the train wasted $500,000 of their time. Of course it was more. Let’s say these folks are worth $20 an hour: they wasted a million bucks. Let’s say they make $30 an hour, a lousy $50 grand a year — do they get food stamps? (That’s 35 hrs X 30 = $1,050 a week X 52 not much more than $50,000 a year). Give some value to the time of those 10,000 retirees, children, and foreigners I set aside for this calculation, then the total waste easily gets to $3,000,000. Sure is helluva cost to having tens of thousands of people waiting an hour or two or three to leave the venue. Every one of them will go home and then to work and tell, what is the figure usually used?, tell 28 people about their terrible, horrible, no-good experience on the Long Island RR. It should be worth something not to have that happen. Or perhaps the cost of improved train service could be taken from the estimated budget for Police overtime at the Belmont Stakes? How many cops do you need to watch a line of tens of thousands of people over 3 hours anyway? Plenty, and they ain’t cheap. So it could be worth investing in better train service for even one day a year! You have the executive/financial class, the political/union class, and the serfs. In that context, most of those riding the train are serfs. Those who think the serf should be grateful for what they got are in the political/union class. The executive/financial class drove or were driven. Or perhaps arrived by helicopter. At least two NJ-ARP members who attended the Belmont attributed the crowding conditions to letters NYRA, not LIRR. And those participants noted that on the return trip, LIRR allowed folks to board climate-controlled trains, presumably with seating, even as the railroad announced trains would not be leaving for x minutes. That contrasts sharply with the approach used by, among others, New Jersey Transit. I’ll leave it up to the wiser heads here to discern whether Jersey guys qualify as “serfs” or might be (dis)qualified as “NY taxpayers” and so forth. The New York Cosmos professional soccer team wants to build a 25,000 seat stadium in one of the parking lots south of the Belmont track. I can’t imagine LIRR adding appropriate service for big matches (assuming the Cosmos ever attract 25,000 fans). It might help if running a special train didn’t mean paying the crew for a full 8 hour shift. The venues in the article all have subway service. That’s the difference. Run a subway line to Belmont Park with a regular train terminus, 2 tracks in/out, and trains can turn quickly. Commuter rail as a spur line for the Super Bowl and Belmont Stakes is woefully inadequate as has now been demonstrated. That’s exactly correct… Yankee Stadium – Citifield – Barclay’s – MSG all have commuter rail – but they also have MULTIPLE subway lines. That’s the huge difference. If the Belmont or Meadowlands were hypothetically at any of those – there would have been no controversy. There is no way that the LIRR will or should expand or improve that station and trackage for once per decade triple crown bids. If they did, people should complain about the waste of money. One thing LIRR could have done is simply sell a limited number of round trip tickets with set train times. I know that this isn’t how the LIRR operates, but it’s consistent with how pretty much every other system works, including Amtrak, and it would solve the problem. The other salient point is that trains are not super-good about moving enormous masses of people, say 10,000 plus all at once, unless they are using enormous multi-track, multi-platform facilities, which do not and are not going to exist anywhere beyond key hub stations. They could probably easily move that many people by turning the station into a single-tracked or double-tracked loop so reversals are unnecessary. Think the abandoned 6 at City Hall or the South Ferry loop. I have no idea how feasible that is here though, even ignoring the expense. The loop would need to have a pretty wide radius just to keep platform gaps down. For one day a year? Shut down a few streets so people can walk to Queens Village and Bellerose (on Hempstead only reroute traffic heading to Belmont, leave lanes still open for people driving out), have people walk to disperse the crowds. Add in a shuttle bus with a dedicated lane to Jamaica and you clear the crowd out in less time without having to build anything new. Unless NYRA wants to pay for the project. The loop system also works well at PATH’s WTC terminal in its various incarnations, but requires a gentle balloon loop layout that takes up a ton of space. I can only imagine the space requirements for a loop running LIRR standard gauge train cars in ten car sets! I was just commenting on solving the problem he mentioned in his last paragraph. I don’t care that much about the station. But one thing’s almost certain: try to get people coming by train onto buses, and the number of people who come by transit will drop off. Actually, a shuttle bus system to the Floral Park train station (much larger than the slightly closer Belrose station), also has ample room for loading and unloading of buses and a straight shot out of the back of Belmont on to Plainfield Ave. The kind if expansion will only happen if and when VLTs are allowed at Belmont Park and Belmont becomes a Racino. I think Aqueduct beat them to the punch. I also doubt that western Nassau County wants anything to do with a casino. Given the reflex hostility to anything that generates consistent traffic or crowds of any sort, I imagine that western Nassau rather approves of the slow decline into oblivion of Belmont and the race industry. Many of the deals were put in place in 2001-’02 concerning that when George Pataki was Governor and when NYRA was under completely different management (and before NYRA dealing with a Federal Monitor thanks to Elliott Spitzer using a teller scandal to help his bid for Governor in 2006 and a subsequent bankruptcy when it was discovered NYRA was a house of cards ready to collapse, etc.). It’s inevitable that Belmont Park will eventually become a Racino. I can’t say that I’m up on the plans for Belmont, but I’d imagine there would be local opposition to turning Belmont into a casino. Racing is dying either way, so you’d end up with a casino with incidental horse racing, and maybe a casino with no horse racing at all. To me, the question is whether Belmont is imply decommissioned as a track, and what that site is used for next. Horse racing is going to shrink down to its market level, now that very few people have interaction with horses on a regular basis and it is one of many venues for gambling. At that point there will be two horse racing venues in New York State — Saratoga and Belmont — and a handful in the country. They should run cross country and bicycle races there too. The Belmont is simply too important a race. The only race on par is The Kentucky Derby. The Preakness is too “easy” a race. The Breeders Cup is just now trying to make a tradition. Both are run by the NYRA… There was talk of closing Aqueduct and “winterizing” Belmont to take all the action. NYRA holds something like 20 percent of the race industry betting. Aqueduct should be turned into a mixed use neighborhood and let Belmont be the downstate racetrack (Saratoga Springs is the “upstate” one). It is worth noting that the Belmont Park station, spur, and trains exist at the pleasure of the NYRA. The NYRA are the ones that are free to spend as much or as little as they want on infrastructure improvements. The LIRR has made it clear that it does not care one bit about what happens to Belmont Park, and the last day the subsidy checks from the NYRA come in will be the last day a LIRR passenger train ever sets its wheels on that spur. That said of course, NYRA is also operated by the State right now. I would be looking to make SOME improvements to that station, but within reason and realizing that unless you want to spend big money to build a second track on the bridge AND a flyover and bridge (which would connect to the westbound local track coming down after crossing over) that would allow LIRR trains to operate more efficiently, you are stuck with the current setup. That kind of spending as noted would most likely ONLY come if Belmont Park became a Racino and would only be warranted at that time. The current single-track lead to Belmont Park dates from the rebuilding of Queens interlocking in the 1920s — which not coincidentally was about the time when the public started fleeing mass transit in favor of the automobile. Prior to the 1920s there was a multi-track lead that connected with the freight track from Hillside. 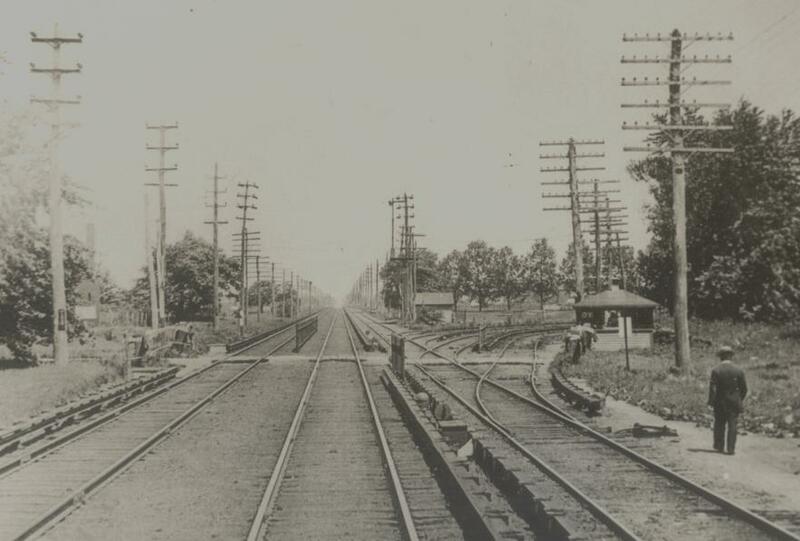 Here’s a photo of Belmont Park Junction circa 1910 that shows a three-track lead curving off to the right, with just a double track mainline and the bidirectional third freight track that extended from Hollis to Floral Park. Westbound trains from Belmont were able to cross over to the westbound mainline track at several locations between Queens Village and Hillside. Of course the real issue is a) How much would it cost to restore that kind of track capacity? b) How much would it cost to maintain what is in essence a limited use station for a once-a-year event? The example of the Franklin Avenue Shuttle comes to mind, after decades of neglect the line was rebuilt, not as a two track line that could serve as a relief line in the event of a line issue near Prospect Park station, but as a single track line with short platforms. On the 4th of June this is exactly what happened when a train failed in the tunnel near Prospect Park and the MTA had to use buses to move passenger rather than divert them via the Shuttle to the transfer points at Botanic Garden and Franklin Avenue. This kind of ’emergency capacity’ shortsightedness is a major issue that needs to be addressed. There is the “other side argument”. Just how often do B and Q trains get “stuck” at the Prospect Park station requiring the use of a fully two tracked Franklin Avenue shuttle with 600-foot long platforms at each shuttle station? Is this more than a “once a year” event? Would not such spending be seen as wasteful by the fiscal watchdogs, and especially by the transit fan fiscal watchdogs? You do not remember the screaming of those folks concerning other projects discussed on this board? The LIRR completely closed down the Belmont station, and now only operate the service when the NYRA pays the LIRR to do so, and during the Belmont Stakes Race. For the LIRR – they have made it plain, the LIRR will not put any money into any improvements. There are longer segments of the LIRR system that are single tracked that carry much more riders daily! There are parts of the LIRR where they want to double or triple track and they run to problems. Unless somebody else comes up with some major money, there will be no improvements to the Belmont station. The LIRR have plainly said that they will not spend a single penny on improvements to a service that they do not want, except for one day of the year!